With the Ducks currently on a bye week and just over half-way through the season, it is a great time to reflect on the first half of the season and look forward to the final five games. Despite the exceptional talent at RB and WR and a solid O-line, the struggles at the QB position have slowed the Oregon attack. 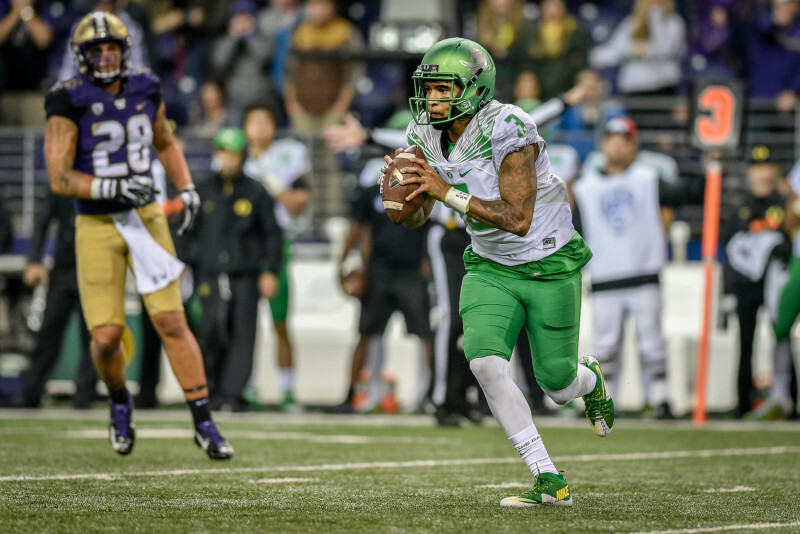 I thought the Ducks’ history of having an explosive offensive regardless of who was behind center would ensure Vernon Adams or Jeff Lockie would be successful, but that hasn’t been the case so far. Lockie and Allie have not been able to do much through the air, forcing the Ducks to be completely one-dimensional when they are behind center. Adams has been the most effective when healthy but has sometimes struggled to make the easy plays — the open seam routes, curls, and slants — but has been spectacular at improvising and making plays when things break down. 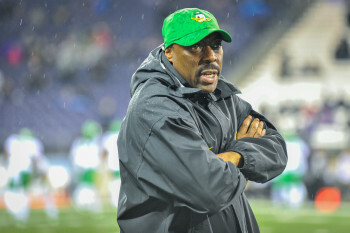 Don Pellum will try to build on a solid defensive performance against UW. The Ducks’ defense showed some marked improvement versus Washington but has struggled this season despite playing mostly 2nd-tier offenses so far. (Oregon has not faced a top 25 offense yet but still ranks 110th in points allowed per game and 113th in yards allowed per game). Oregon’s front seven is manned by seven senior starters with plenty of starting experience and has been serviceable against the run. The young secondary has been picked on all year. They have also been hampered by having two of their most experienced players, Chris Seisay and Reggie Daniels, miss multiple games. This has contributed to the Oregon defense being inconsistent. In the preseason I predicted that the Ducks would go 10-2 or 9-3 this year. While 9-3 is still in play, the Ducks will have their work cut out for them to run the table with five difficult Pac-12 conference games left. The Ducks wrap up the season against the rebuilding Beavers in the Civil War. First year coach Gary Andersen seems like a great hire for the Beavers, but this was not the promote-from-within hire like Helfrich was at Oregon, where the coaching staff remained almost fully intact. The Beavers revamped their coaching staff, and it will likely take a few years for them to recruit the players to fit their scheme before they field a solid football team. However, the Pac-12 has been proven to have a lot of parity top to bottom and anything can happen in rivalry games, especially with how inconsistent the Ducks have looked this year. This Thursday the Ducks face a talented but inconsistent Arizona State team. The Sun Devils have looked poor while getting beat badly by Texas A&M and USC but have looked solid in a strong win over UCLA and through the first three quarters of the Utah game. ASU quarterback Mike Bercovicci has a big arm that could spell trouble for the Ducks’ vulnerable secondary. Additionally, ASU’s all-out blitzing defensive scheme could create problems. Despite these weapons, the Ducks have a great chance to win this game. In a later contest on November 7 when the Ducks host the Bears, California’s Jared Goff will pose a huge challenge for Oregon’s secondary. Goff is a special talent that is expected to be a high NFL draft pick next spring, but the inconsistent play along Cal’s line has made them vulnerable to sacks and turnovers this season. Cal’s defense has also had its struggles. This game will likely come down to how much Oregon’s secondary can improve. With improvement, the Ducks could make this a difficult day for the Bears. Oregon hosts USC on November 21 in another intriguing match-up. The Trojans have the athletes to compete with anyone in the country but also have shown a lack of discipline that has led to a 3-3 record as of this writing and their coach being fired. Senior quarterback Cody Kessler has the talent to give the Ducks’ secondary a really long day, but the Trojans’ defense has consistently found itself out of place and giving up big plays despite the talent (sound familiar Ducks’ fans?). This game will likely come down to which defense makes the fewest mistakes. 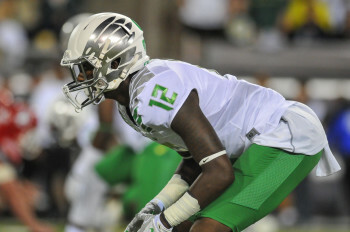 Chris Seisay has been missed in the Ducks’ young secondary. Stanford hosts the Ducks on the farm on November 14. And after laying an absolute egg in Week 1 against Northwestern, the Cardinal have looked unstoppable since, rolling off six straight impressive victories (pending the late-starting UW game today) and climbing up to the top 10 in the polls. All their new starters on defense and on the offensive line are finding their stride, and Stanford looks like Stanford again. The biggest difference, though, with this team as of late has been the lights-out performance of QB Kevin Hogan as he has been statistically the top QB in the Pac-12. Unless a completely different defense emerges for the Ducks in the 2nd-half of the year, it will be difficult for the Ducks to pull off the upset. If Adams can stay healthy and become more consistent in his reads and execution of the Oregon offense, and if the Oregon defensive coaches and players can find a way to play more disciplined, consistent defense, the Ducks have the talent to run the table the remainder of the year and challenge for a New Year’s Six game and a top 10 ranking at the end of the year. Arizona State FootballCalifornia footballOregon DefenseOregon FootballOregon Offenseoregon state footballStanford footballVernon Adams Jr.